The beginning is hard and challenging. Start-ups are particularly important to us and we therefore want to support them by offering special services. We will not make you angry. Jointly, we will find out which adjustments can be made. Often times, this shortage is connected to an internal pain – this is what Oscar Wilde wants to say with his quote. Our team is composed of different experts with long-standing experience in the fields of marketing, e-commerce, IT infrastructure, ERP/WWS, events, corporate governance, brand development and agile management. At the beginning of the consultancy, there will be a match between you and your key account advisor. He or she will advise and assist you throughout the entire advisory process and will find out together with you which adjustments should be made next. Together, we will set and track goals to bring your company to a new level. We bring together what belongs together. 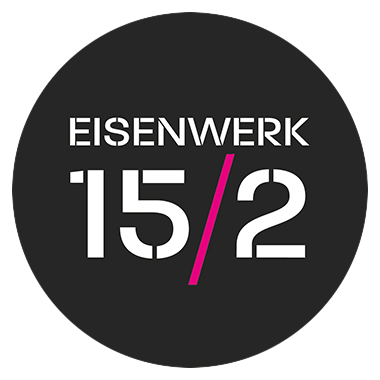 Eisenwerk 15/2 was created in the context of networks. The two heads behind Eisenwerk, Alexej Konikov and Thomas Meisner, come from two very different sectors. Alexej Konikov started engaging in online marketing and e-commerce at an early stage and later opened the agency clarsynn. Thomas Meisner gained his first founding experience in the field of IT and event technology. He is the founder of Veosion GmbH. When they met, they noticed that they both had only very few connections to other people with founding experience. In endless conversations, they found out early how important networking is in order to boost ideas and how different sectors and perspectives connected to them can help along. In Eisenwerk 15/2, we offer an atmosphere that makes it easy to network, to think and to help. We would be glad to open doors for you and make connections in different sectors. Do you have any further questions about topics that you have not gained any experience about yet? Authorities, design, receivables management, logistics partners – we do not only provide contacts, we can also draw from a lot of experience and are still gaining experience through success as well as through failure. We are eager to share our experiences with you and to connect you quickly with the right point of contact. Here, we distinguish between two support options. Tips and feedback is always immediate and free of charge. If you plan to outsource an entire division of your company in order to focus on your core business or if you scaled growth to such an extent that you need help, we will provide you with assistance from our team of experts in the short- or medium term. We will provide you with our resources and help you expedite as well as promote your goals and plans. You want us to support you and provide you with an active coaching process, financial support and access to a strong network? Contact us and send an informal application to inkubator@eisenwerk15-2.de – our team will then make an appointment with you and your team. Many ideas and start-ups fail due to the logistics infrastructure, the warehouse and the processes. We do not only provide you with a storage area. We advise you on the use of packaging material, protected delivery and all other questions that come up after the transaction. In the decision making process, we will be by your side with advice and can make suggestions – but in the end, you are the one who makes the final decision. We can take over processing for you completely. Your products will be stored safely and they will be insured. As soon as the transaction is completed, the packages will be processed and dispatched on the very same day until 3 p.m.
After the transaction, return orders can be processed. You will have direct as well as indirect contact with the warehouse staff. It is an exciting and hard way from the idea to a functioning business model. We focus on long-term success and long-term relations. For this reason, we invest our capacities in human beings and not only in business models. We believe that an integrated approach is most effective for long-term success and that this can bring a lot of fun at the same time. In our individually developed coaching process, we take your personality into account, develop new skills with you and help you focus more on your personal goals. The coaching process is connected to strong commitment on your part and a high investment on the part of the coach. You will have a meeting with your coach on a regular basis (approximately once every 4-8 weeks). In the meantime, you will work on the challenges that you have spotted with your coach. During the coaching process, you can reach your coach via telephone for consultations and further questions.